Roberta Rempfer-Smith was a substitute teacher for 18 years in the public school systems of DeKalb and Kankakee Counties, Ill. She began her teaching career in Wabash County, Ind., in 1944 in a one-room country school on a dirt road. This school was very similar to the one-room school she attended for the first eight years of her own education. Mrs. Rempfer-Smith was a full-time classroom teacher for five years. She was a pre-school child care director for 11 years, and tutored collegiate athletes for approximately eight years. She returned to school at the age of 69 to study behavioral disorders in special education. She earned a certification in this field and worked as a substitute teacher for disabled students with behavioral problems before retiring at the age of 75. One of the highlights from her time at Northern Illinois University, where she worked as an academic tutor to athletes, was meeting Carol Owens. Ms. Owens broke every record in women’s basketball at Northern Illinois University, and played in Japan and Spain following her graduation before starting her own coaching career. There was no Women’s National Basketball Association at that time. Ms. Owens is currently the head women’s basketball coach at Northern Illinois University. Mrs. Rempfer-Smith hopes to assist Ms. Owens with any tutoring needs she may have for her athletes, on a volunteer basis, since Mrs. Rempfer-Smith’s home is less than eight miles from Ms. Owens’ office. From 1965 through 1975, Mrs. Rempfer-Smith helped many families in DeKalb County settle out of the migrant stream by assisting them in earning their general education diplomas. In 1968, she founded the Children’s Learning Center, a child care and pre-school center for migrant children from ages one month through five years, which also offered adult education for who served as teacher-aides at the Center. It was the first migrant center in Illinois to offer adult education to staff members and the migrant parents of the Center’s children. It was also the first to be integrated with a multicultural, bilingual curriculum, and the first migrant center in Illinois to become a year-round program. Now, 41 years later, the Children’s Learning Center is still thriving by teaching children of all races to laugh, live, love and learn. In its early years, the migrant center expanded to serve migrant children ages 5 through 10, with a Title I school, funded by the Illinois State Board of Education. Mrs. Rempfer-Smith left the Center in 1975 to be a resource person for the Illinois Department of Children & Family Services in the areas of programming and budgeting for all of the migrant centers in Illinois. She also directed the Little Star Migrant Center in Kankakee from 1977 through 1979. From 1980 through 1982, Mrs. Rempfer-Smith was employed at Chanute Air Force Base in Rantoul, lll., where she directed and managed the child care program. She raised the average daily attendance from 98 to 200 within three months, achieving the highest standards of cleanliness, nutrition and educational programming. While working at Northern Illinois University from 1984 through 1988, Mrs. Rempfer-Smith tutored high-achieving athletes in the sports of wrestling, football, and men’s and women’s basketball. She traveled with the men’s basketball team as its private tutor in 1988. Mrs. Smith had to return to Kankakee in 1989 to care for her mother, and subsequently applied for a position as a tutor for the basketball team at Kankakee Community College. She tutored there from 1990 through 1993, mostly as a volunteer, and was asked to a “house mother” for a Lithuanian basketball star that the college had recruited. His name was Alvydas Pazdrazis, and he was eager to quickly improve his English and transfer to an institution in Lake Charles, La., from which he graduated. Now he works as an international recruiter for the Dallas Mavericks. In 1996, Mrs. Rempfer-Smith founded and organized a Hispanic United Methodist Church in Kankakee County. Other United Methodist members were involved in this endeavor. They were very successful, and the new church group met every Sunday afternoon at Mrs. Rempfer-Smith’s home from June through August. The pastor was from Mexico. By September, the United Methodist Church at Momence invited the newly-formed church to meet in its church on Sunday evenings, and the services were held in Spanish. On January 1, 1997, Mrs. Rempfer-Smith left for Red Bird Mission in Southeastern Kentucky to work as a volunteer teacher at the mission school for one semester. She returned to Kankakee in May, after she experienced a bad fall, marking the beginning of six-and-a-half years of surgeries, including five total joint replacements. She substituted mostly in special education for the first four years, in between surgeries. Mrs. Rempfer-Smith had been a widow for 28 years, when in June 2001, she was reunited with Robert W. Smith, a retired engineer in Carlsbad, Calif. The former couple had been apart for 56 years. They had been high school sweethearts during World War II, and were separated in December 1945, when Mr. Smith got out of the navy, and Mrs. Rempfer-Smith was a college freshman. They married in January 2002, had a glorious honeymoon in Maui, Hawaii, and lived in Southern California for seven years. They now reside in Sycamore. Ill. Mrs. Rempfer-Smith needed to return to her beloved Midwest, where she relied on all of her memories as a teacher to help her through her octogenarian years. Ms. Rempfer-Smith’s motto: “Go ye therefore, and teach all nations, baptizing them in the name of the Father, and of the Son, and of the Holy Ghost. Teaching them to observe all things whatsoever I have commanded you. And, lo, I am with you always, even unto the end of the world. Amen,” is from Matthew 28:19-20. Mrs. Rempfer-Smith is passionate about working with children and all students, and advises fellow educators to unconditionally love children and work in their best interest. 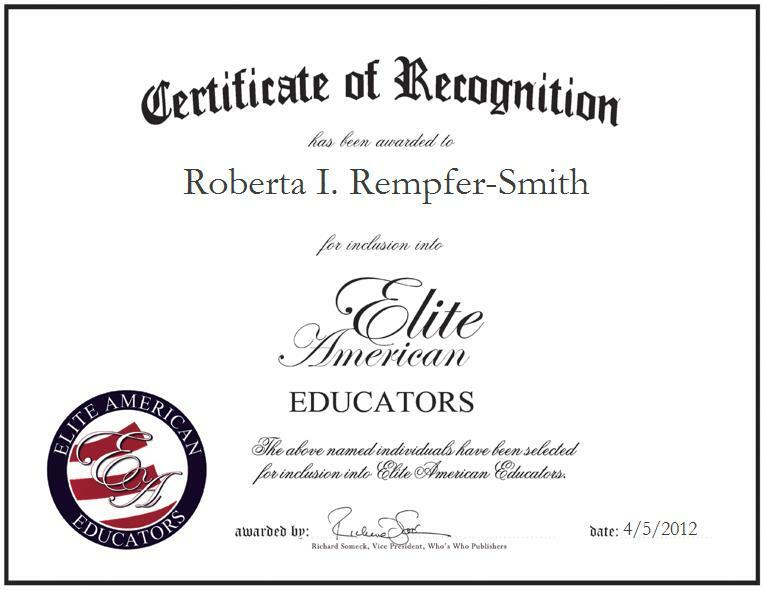 She dedicates her EliteAMERICAN Honoree recognition to her first husband, Vernon Rempfer, and their children, Ann, David and Michael.